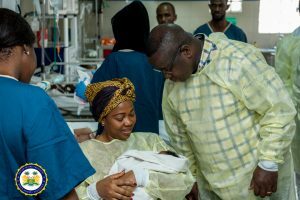 Freetown, Sierra Leone, Saturday 6th October 2018 – The caring and compassionate President Bio and the First Lady, Fatima Bio have visited 34 Military Hospital, Connaught Hospital, and Emergency Hospital to sympathise with the victims of the two fatal road accidents involving military and the police. The visit started at the 34 military hospital where President Bio and the First Lady spoke to the victims on their beds about the medical care and recovery. President Bio and First Lady also thanked the doctors and nurses for the care and medical support they have given to the victims. 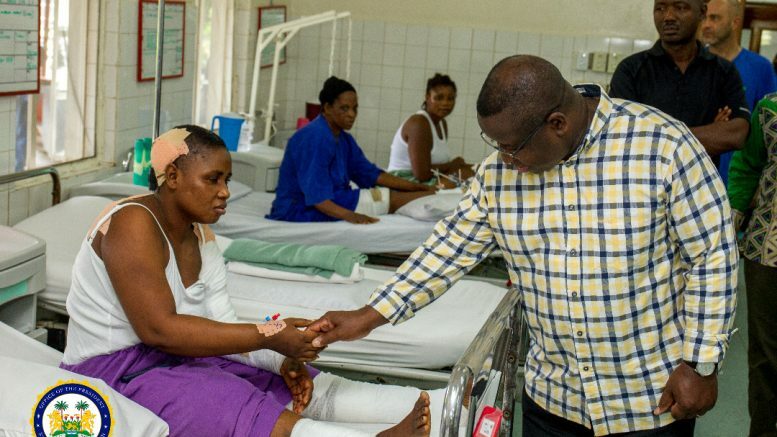 From 34 Military Hospital, His Excellency President Bio and First Lady also visited the Connaught Hospital where victims of the fatal road accident involving military personnel were admitted. At Connaught, both President Bio and First Lady also spoke to the victims on their beds enquiring about their recovery and the extent of their injuries. The medical team at Connaught Hospital also gave the President update on the recovery of the victims and others who have been transferred to Emergency Hospital because they needed surgery. 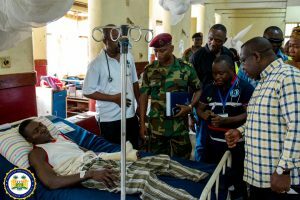 From Connaught Hospital, His Excellency President Bio and First Lady also visited the Emergency Hospital to sympathise with those suffering from major injuries and needing critical medical attention. Received by the Medical Coordinator, Ljubica Ledenski, President Bio and First Lady visited victims on their beds, shared with them words of encouragement and prayed for their speedy recovery. At the Emergency Hospital, President Bio also visited the bed of Yusuf M. Kamara who was one of the victims of the road accident along spur road involving police personnel. Yusuf who suffered from Pelvic fracture. He was comforted by the President and wished a speedy recovery. 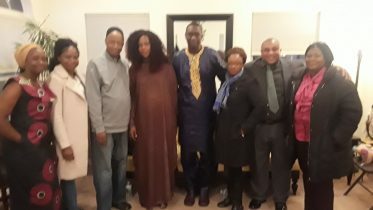 While the visits were only meant for the victims of the fatal road accidents involving the military, police, and civilians at the Emergency Hospital, President Bio and the First Lady also requested to visit other patients who were in critical conditions. They visited the children’s wards were they heard emotional stories about the hospitalized children especially those suffering from severe medical and surgical conditions. The two separate road accidents involving military and police occurred on Monday 1st October 2018. While the Inspector General of Police reported that there were only three injured persons from the crash involving the police personnel, the fatal road accident involving the military vehicle has recorded fatalities, and more victims admitted at the 34 Military Hospital, Connaught Hospital, and Emergency Hospital. An inter-faith funeral service is expected to take place at the Hockey Pitch, Wilberforce Barracks on Tuesday 9th October 2018 for those who lost their lives and internment is scheduled to take place at the Military War Grave, Lumley. While in the United States both the President and the First Lady were very saddened when the news broke of the fatal road accidents. As a compassionate couple, they instructed that their first engagement on arrival should be to visit the victims of the accidents. For President Bio, the accident involving the military personnel is also personal because he is the Minister of Defense and Commander in Chief of the Armed Forces. In all the hospitals, patients, nurses and doctors praised the President and First Lady for their caring nature. 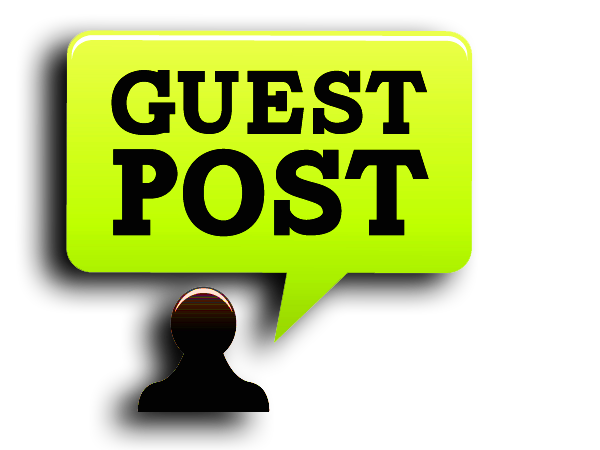 Be the first to comment on "President Bio and First Lady Visit Victims of Accidents in Hospitals"